What truly changed the game, though, was the online community. Now, with the power of thousands of players at its back, the game will never cease to amaze as wonderful, challenging and sometimes hilarious maps are continually released on a weekly basis. 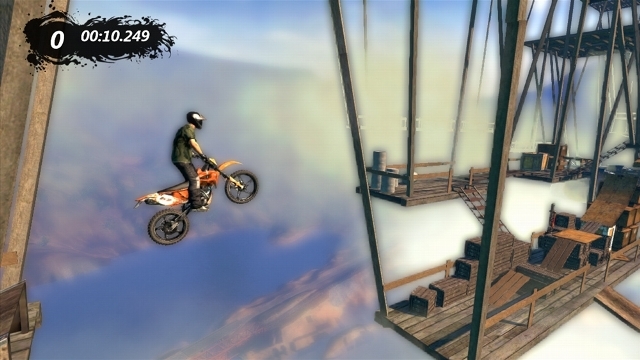 With Trials Evolution, RedLynx was able to create a game that will seemingly never end. It is rare to find a game that is so terribly frustrating and yet makes you never want to put the controller down. Vasu Chetty, Contributor — Although Dust: An Elysian Tail is probably most famous for its beautiful visuals, which are extremely fresh and vibrant, my favorite aspect of Dust is its simple yet extremely satisfying gameplay. The overarching Metroidvania-style gameplay is familiar to many, which makes Dust easy to pick up and play, but it is the nuances in the combat and RPG elements that really make it stand out from other games built in the same this same vein. From early on in the title, Dust does an amazing job at making you feel powerful, yet still very vulnerable, an interesting balance that it maintains perfectly throughout the experience. The combined interaction of Fidget’s magic along with Dust’s swordplay makes for some spectacular visuals while allowing you to wreak havoc on the enemies in Falana. There are few action moments in gaming more satisfying than successfully pulling off a one-thousand-hit combo that requires dodging, quick sword attacks, well-timed parries and magic mixed with a spinning sword. Dust’s vulnerabilities are more apparent when playing on harder difficulties, where enemies can swiftly dispatch of him fairly quickly, and this combat difficulty adds to the intensity of the game and requires more deliberate thought than simple button-mashing can provide. 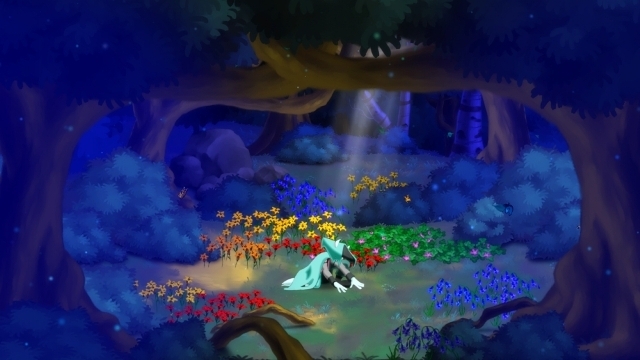 Dust: An Elysian Tail is an incredible game that mixes beautiful visuals with an interesting story and memorable combat. I can’t wait for the sequel! 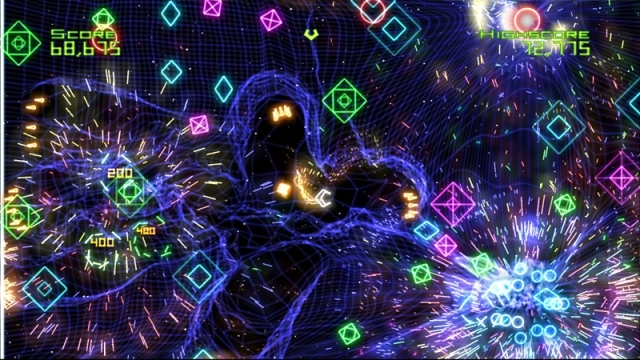 Alex Esten, Contributor — Geometry Wars saw humble beginnings. Originally conceived as a funny little minigame in Bizarre Creations’ Project Gotham Racing 2 (PGR2) on the original Xbox, nobody could have ever expected the quirky, twin stick, Robotron-styled arcade shooter to launch an entire franchise. Once we discovered this gem’s beat-up arcade cabinet in PGR2’s in-game garage, we stopped playing PGR2 for the racing, and started playing it for Geometry Wars. Then the follow-up, Retro Evolved, hit the Xbox 360 and clinched my love for this series. I was never particularly good at it, or rather, I never excelled at it, but that never really mattered. It was a fast, nutty, esoteric take on a gametype I always loved, but it defied genre conventions every step of the way. Think your upgraded weapons will make things easier? Not so. They distort the playing field. Think clearing the board with a bomb nets you some breathing room? Not really. The enemies will respawn just as fast as you killed them, you monster. 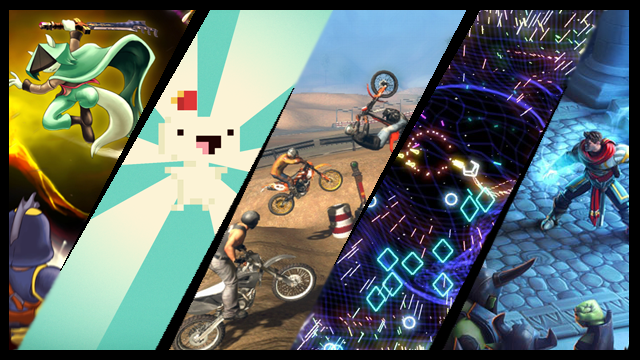 Retro Evolved 2 was nothing short of spectacular, as well. It took the “basic” Geo Wars template and turned expectations on their heads. The sequel introduced new game modes, co-operative play (with one of the more delightfully twisted control methods ever conceived), new enemy types and scoring options in a stunning audiovisual presentation that made the first Retro Evolved look downright elementary. Geometry Wars is the gaming equivalent of an Isaac Newton nightmare: for every player action, the game has an equal and opposite reaction. Like every great arcade game, it plays against you just as much as it forces you to play against yourself, and for that, it has my respect. Mike Mahoney, Contributor — Strategic tower defense games are not my strong suit, not by a long shot. In fact, I tend to avoid them as if they were the plague. But I do have a soft spot for killing orcs, so when Robot Entertainment released Orcs Must Die! in 2011, my interest was piqued. The game features a loosely based story in which you play as a war mage who unfortunately is the realm’s last hope. 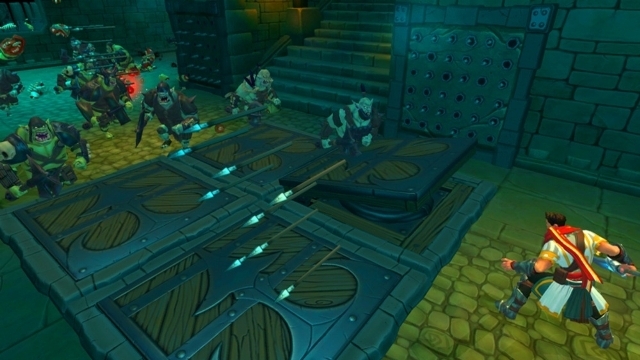 In Orcs Must Die!, the view is set to a third-person action perspective, and it works well with the cartoony art style. In the 24 levels you have access to, there are many weapons and traps put at your disposal. The vast ways in which one can kill an orc in this game are downright addicting and hilarious. The early levels, as to be expected, are quite easy, but then the game quickly ramps up the difficulty. The replay-ability is off the charts in this game, as you can always go back to levels and earn more skulls, which in turn can be used to purchase even more traps to tackle the over-the-top difficulty levels. My only gripe with this content-loaded game, is that there is the obvious omission of a co-op mode. In a crowded pool of tower-defense games, Orcs Must Die! stands out because of its not-so-serious approach to a rather stuffy genre. 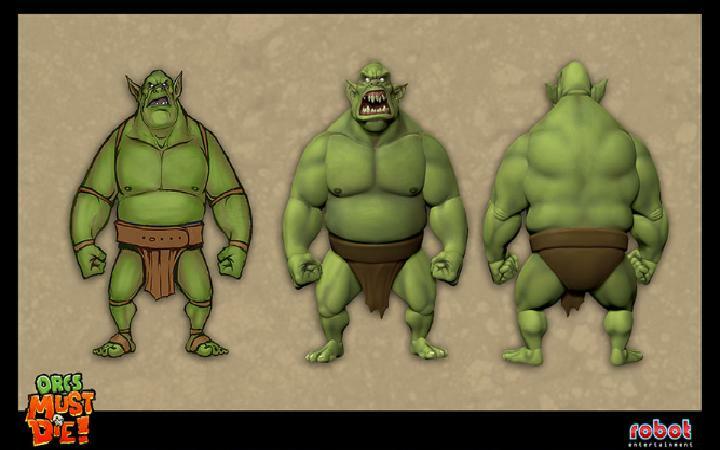 Killing orcs should be fun and with Orcs Must Die!, the developers nailed that aspect of the experience and then some. Nathan Bowring, Reporter — There’s a lot more to Fez than meets the eye. What begins as a charming 2D platformer is turned on its head once player-character Gomez dons the game’s titular hat. Polytron’s Fez revolves around the ability to turn a 3D world around to see all four sides of it, only to make the player move across it on one 2D plane at a time. The concept takes time to get used to, but soon enough it will become second nature as you explore the world collecting cubes. The world’s pixel art is amazing, but it also holds many secrets. The game has a large focus on puzzles, which isn’t always apparent. 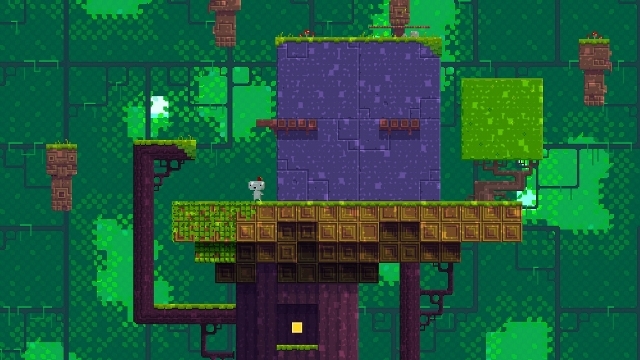 Only those with keen eyes and sharp wits will be able to solve some of Fez‘s tougher puzzles (without looking up the solution online, that is). To be honest, there’s still some puzzles that stump me, and that’s partially why I love this game so much. Gomez’s adventure may be a loving throwback to retro gaming, but its unique mechanics make it feel so fresh and new.